Times Square: Broadway at 42nd St.
Times Square: Broadway btw. 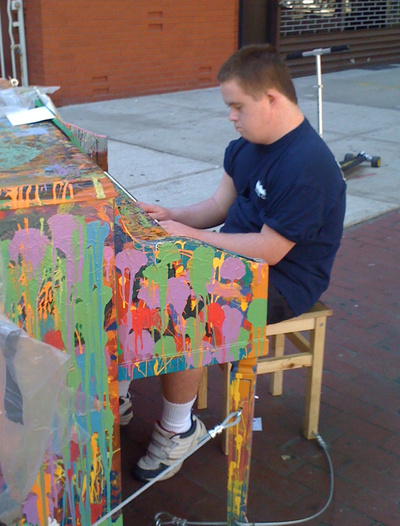 45th St. and 46th St.
7/5/10—Day 6, 7th piano (around 6:30 p.m.) Two beautifully painted pianos. We met a little boy who proudly told us he and his mom were the piano buddies here. Taylor Causey, from Athens, Ga., plays a song he hears from "Lady and the Tramp." 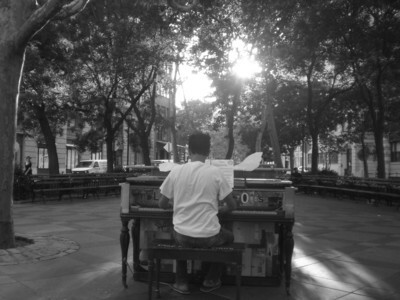 "Play Me, I'm Yours" was a dream come true for me: playing piano on the streets of New York in just about every location imaginable. I can't thank Luke Jerram, sing for hope, and all the volunteers enough for pulling off this special event. It was amazing to see so many pianists come out and play, and especially touching to hear so many gifted and talented children step up to what is a very challenging instrument (and play it in public on one of the world's biggest stages). In the beginning, I set out to play all five boroughs, but soon realized my day job wouldn't easily accommodate all the travel and logistics involved. So I reset my sights instead on playing every available Manhattan piano (and a few in Brooklyn and Queens). By the end of two weeks I had achieved my goal. My pieces are all improvisations, so playing on the streets of New York allowed me to share my spontaneous, energetic music with a city whose rhythms and tones have informed and influenced my music for years. The chance to publicly give back to a city whose people, music, and spirit have brought me joy for decades was the opportunity of a lifetime. Thanks for watching and listening.